In the ever increasing desire that more and more people have to become more self-sufficient and environmentally friendly, homes are beginning to take a new turn for the greener. 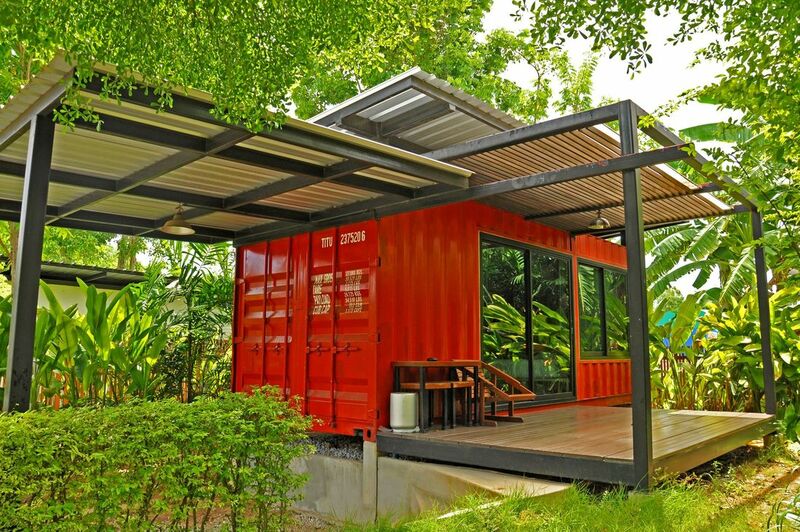 Shipping container homes utilize the leftover steel boxes used in oversea transportation. But now, instead of being dark spaces filled with objects, they are becoming beautifully architected homes and living quarters. This trend began soon after 2000 after many people became aware of the increasing number of containers left abandoned on ports. Sold at incredibly low prices, they’re ideal for creating cost effective spaces and have the added benefit of using recycled material and eliminating waste. The typical box measures 20 to 40 feet long, 8 feet wide, and 8 1/2 feet tall. The perks of using one of these to create a home or bunker with are many. For starters, they are nearly indestructible and made of Corten steel, which doesn’t rust. They’re also mold resistant and have a plywood floor that can hold literally tons of weight. These things are meant to keep cargo safe during hurricanes, tornadoes, typhoons, flooding, lightning, and anything else Mother Nature decides to throw it’s way. Shipping containers are easy enough to find and have delivered to your site or home. Purchase through a nationwide broker, an auction site (like Ebay) or someone local. Delivery is done by semi trailer, so be sure that your location can handle is accessible enough for the initial drop-off. The containers don’t cost more than a few thousand dollars each, making them incredibly affordable. Taking advantage of the popularity of modern architecture, this home stands out from the natural landscape. They played off of the varying hues of sand and dirt to create a staggered texture on the outer wall. The middle section of the house is unique in it’s double layer, where the designers have cut away long windows to draw in light and continue the staggered linear theme. Atop the lower levels they have constructed balconies to overlook the hills and valleys that surround them. This specific house was built on a hill, enabling them to have part of the containers jutting out and giving the possibility for a walk-out basement. The containers are sturdy enough to handle this with ease. 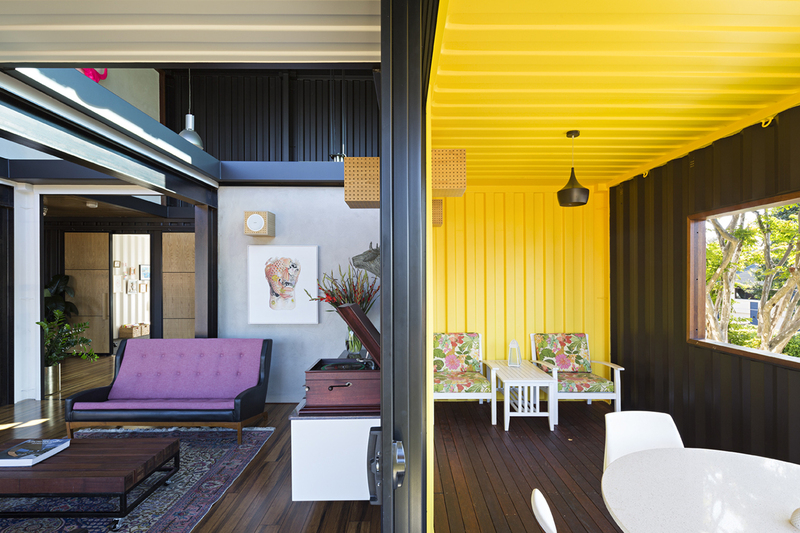 This chic, modern container home in Australia really embodies the vibrancy of the owners’ personalities. Large window spaces were made throughout each room so that natural light could help the space seem open and large. The ridges on the containers were almost an inspiration for the linear themes and simplified color schemes of the home. The containers are incredibly strong and very able to be stacked upon each other. These designers were able to create a multi-level common room appearance by cutting specific parts out of containers. The second-level patio is a spectacular design, holding the theme of boxes or squares, and simultaneously giving cover for the patio underneath. Perhaps it isn’t necessary to have multiple levels of containers. 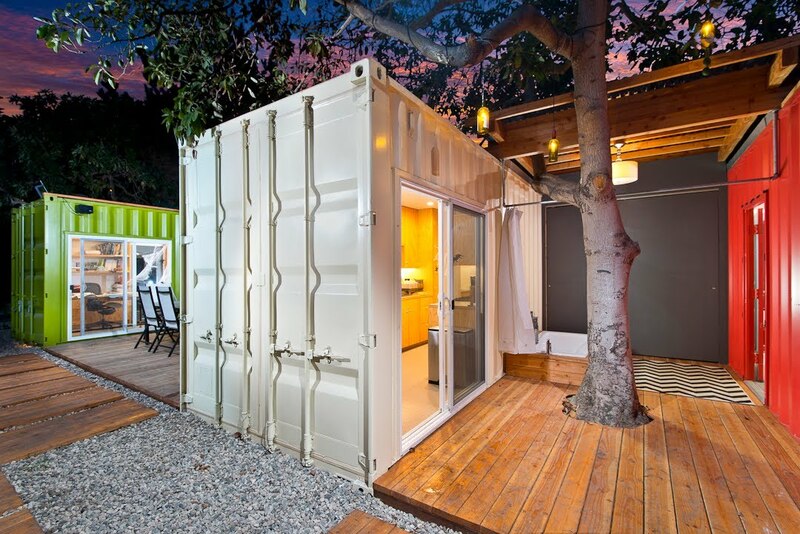 In that case, go for a storage container studio and utilize more of the outdoor space around the home. This studio home has a covered driveway right along side the living quarters. A porch overlooks the yard and has plenty of space for a desk, chair, or future grill. Yet again we see the use of large, spacious windows. The containers are obviously very dark without enough natural light entering in, so finding a part of the wall that can sustain a large window is a must. 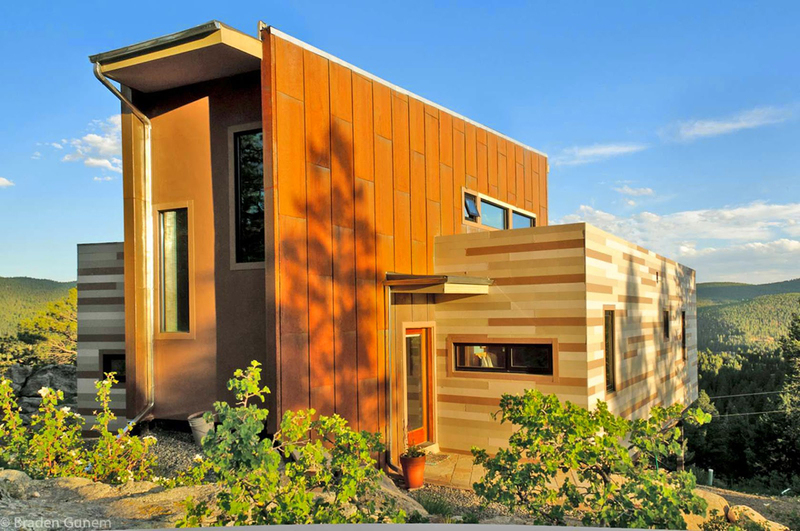 Here we see an example of the strength of a container house. This home is an eye-catching design, with the second level hutting out over the patio and providing cover and shade. A whole side of the container facing the patio on the first level has been made into window, making both the inside living quarters and the outside patio area feel exceptionally large. Through all the windows you can see a modern-designed staircase leading up to the second floor. The stair case slightly winds, allowing for it use minimal space and to keep what could be tight quarters, quite open. The windows on the top floor are floor to ceiling, embracing the natural light and whatever weather the day brings. 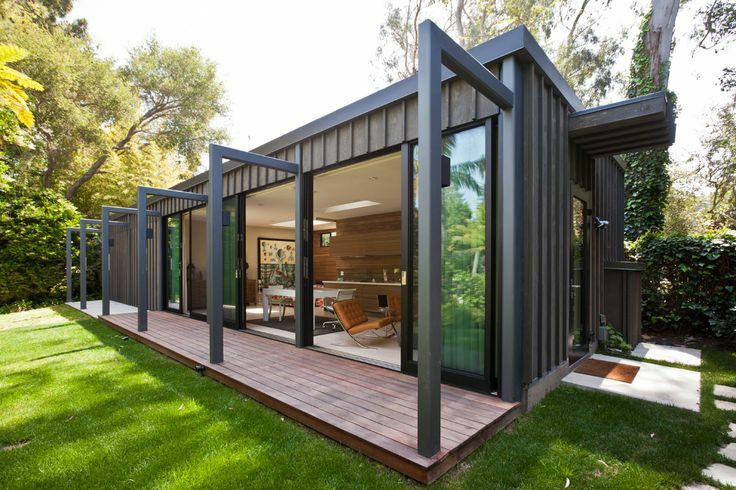 This shipping container house showcases well the combination of modern lines and flowing edges. The patio area has beautiful curtains along each post which give a more graceful feel to the building. The curving lines give a feel of movement to the clean lines sand edges of the interior. The incredibly large sliding door is an excellent way to save space and create a way to easily enjoy the inner patio area in less favorable weather. The outer patio utilizes fabric across the open tops as a way to create shade, yet again keeping the theme of clean lines and simple shapes. This home is unique in two ways. First, the house itself embraces the box shape. The upper level has a corner window, which highlights the square feel while also keeping it from seeming dull or boring. Underneath, they have created a well lit space with multiple floor to ceiling windows. 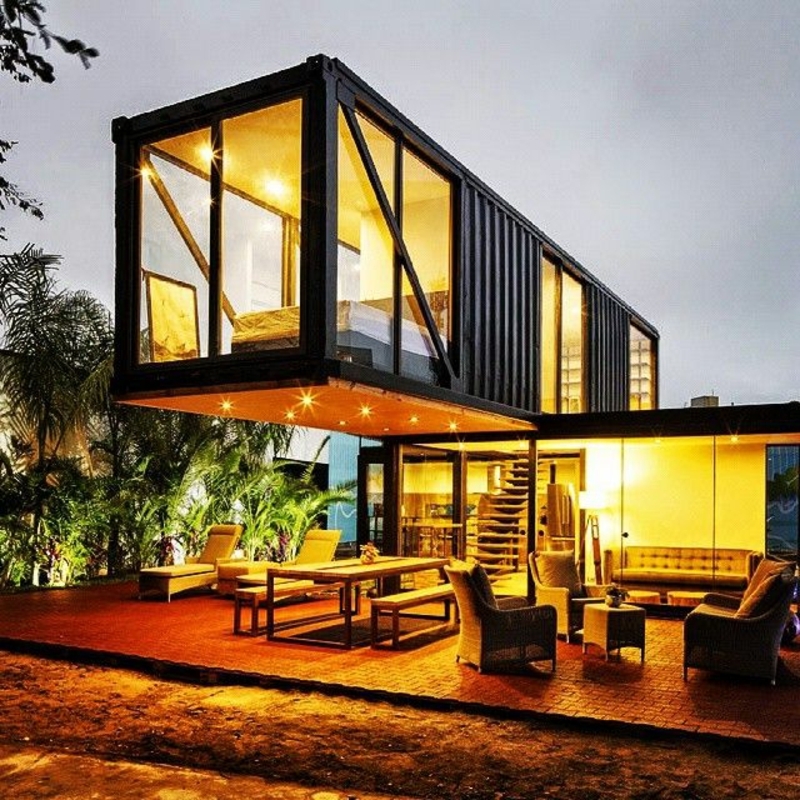 This all overlooks a pool in the distinct shape of a shipping container, a great way to tie in the home design with outer recreation. Secondly, just beside the house, they have constructed an eating area with a large grill. This is a great place to host larger parties while keeping them covered and giving them space. The seating area is atop a deck that gives the impression as having just fallen off of the open side of the container. Yet again, the furniture is modern and curvaceous to accent the linear and boxed shape of the containers. This open design also features a large porch area. What these designers have done differently, however, is by allowing the open porch design to stay open and free from covering. This allows more sun to enter the home, which, if there is anything that makes a home look beautiful, it’s natural light everywhere. These home owners also have sliding doors, keeping it simple and chic. Inside, they use lines to create a wooden barrier wall between rooms. Container space adds up quickly once you place a few next to each other and get ride of dividing walls. This home shows how much room you can have by dividing the space on your own. Yes you might have just entered Heaven. This beautiful white home has decided to cover up the side walls of the container, creating a smooth appearance. They’ve left the ceiling, however, which gives the perfect amount of linear accent to the rest of the design. The kitchen is open with an island placed between two supporting beams. All of their furniture is either white or silver, which does an excellent job contrasting the few instances of charcoal black, light brown, or a pop of color. The lights, appliances, and other hardware keep a clean industrial feel and appearance, which allows the house plenty of breathing space and keeps it from being cluttered. If you’re all the rage for the new mini-home ideas and plans, then you’ll love the combination here. Finding a smaller than average container doesn’t mean you have to pass it up. Use it create a simple guest lodging area or make it for yourself and minimalize your carbon footprint. This mini container home has a bathroom with stand-up shower on one side and a kitchen on the other. Right in the middle is the sleeping quarters, which have perfect access to the porch and open sun area. Large windows keep this small structure from feeling too dark and restricted, and by using blinds, they are able to keep a high amount of privacy as well. This multi-level home seems like a container of fun. Using various bright colors on the outer walls gives the feel of modernity and freshness. Plus, the top level that juts out over the patio beneath is a perfect place for bookworms, game addicts, or a lazy day off. The lower level is kept open despite the lower ceilings by having large glass sliding doors and windows. This all leads out to an open patio design kept simple with minimal furniture and a well paced potted tree. Combining the textures of wood, cement block, and container, this home has managed to be an economical and modern escape. 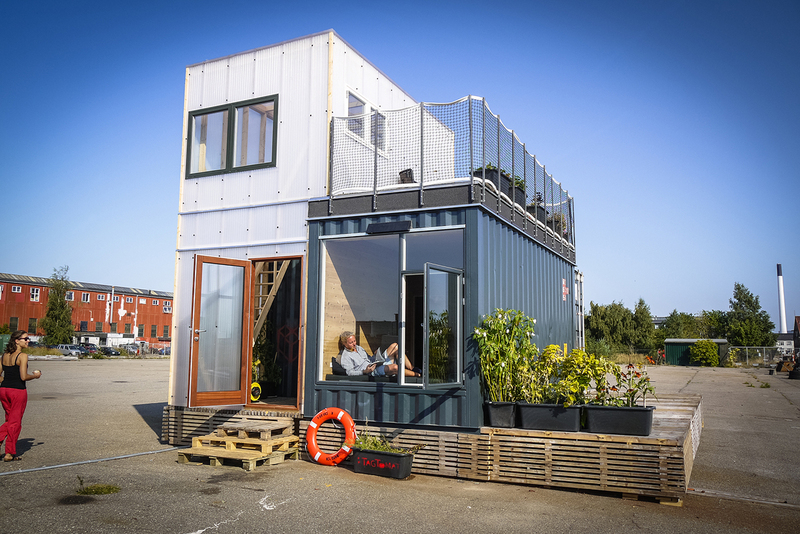 Not every container home has to be entirely containers. 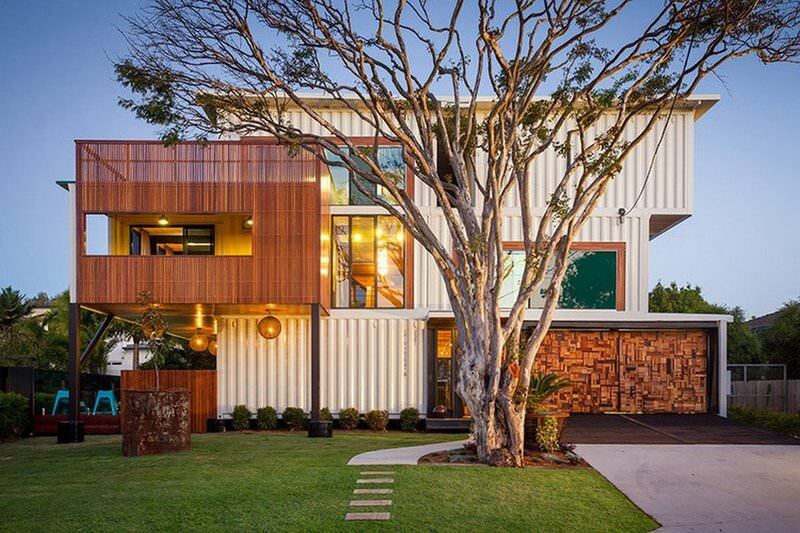 This house combines a large open factory like interior with a jaw-dropping container end. 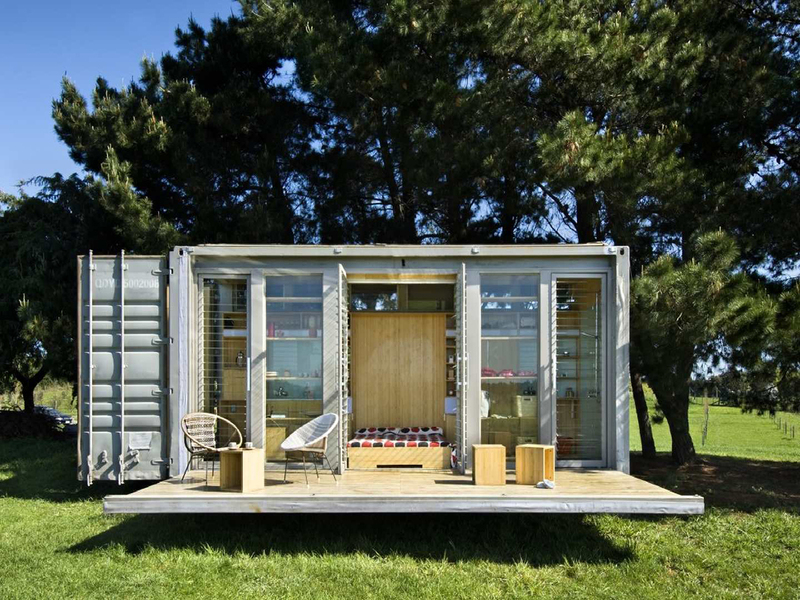 Nine containers stacked on each other provide the perfect place for private rooms and less airy dimensions. The top floor has an exquisite spiral staircase entrance and have increased privacy with thick curtains. Other guest rooms on the bottom floor have similar privacy curtains. Each container sports full windows on both ends, giving great views of the main room as well as the yard. What is especially neat about this home is the more antique choices of furniture and inner design. The rustic wood and aged appearance of the boudoir pair really well with the open, modern appeal. 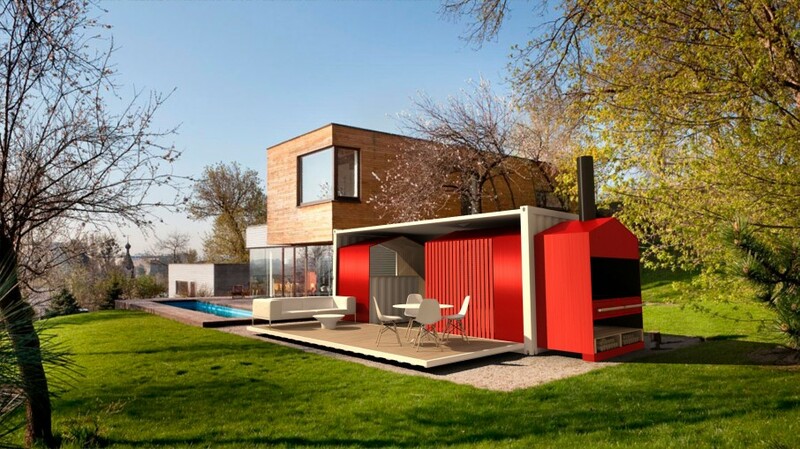 Having fun with the idea of a shipping container home is one of the best parts about construction. This home took on a parceled feeling, having rooms separate and yet attached by covered walkways. This provides an amazing amount of patio and open-air space, keeping the home fresh and airy. They’ve seemed to embrace this, as a large tree is even growing out of one of the patio areas. The combination of stone and wood keeps a natural and authentic feel to the otherwise metallic appearance of the containers. They have also done well in keeping the vibe fun and upbeat, painting the containers bright, simple colors like red, white, and green. Because the shipping boxes are that basic rectangle, playing with other forms, like the chevron rug pictured above, can add a distinct flavor to the home design. 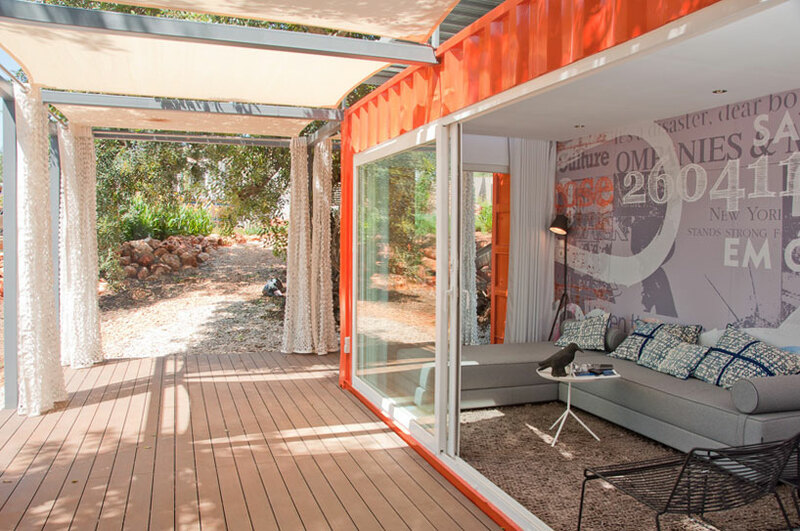 Not having much of a yard is no excuse not to embrace the open air qualities of container homes. This pallet inspired home rests on a concrete lot and makes it look a whole lot more chic because of it. Large windows face the morning and afternoon sun, giving ample light indoors. On top, there is an open patio area with a high fence. This owner is utilizing the space for a container garden. A loft area is large enough to house a small bedroom, leaving the downstairs to be the main living quarters, kitchen, and small bathroom. This owner has used a creative window opening, choosing a smaller segment of the otherwise quite large window to actually open. If it weren’t for the giveaway ridges signifying that this is indeed a container home, one might think they’ve in a traditionally built, yet modernly decorated, house. 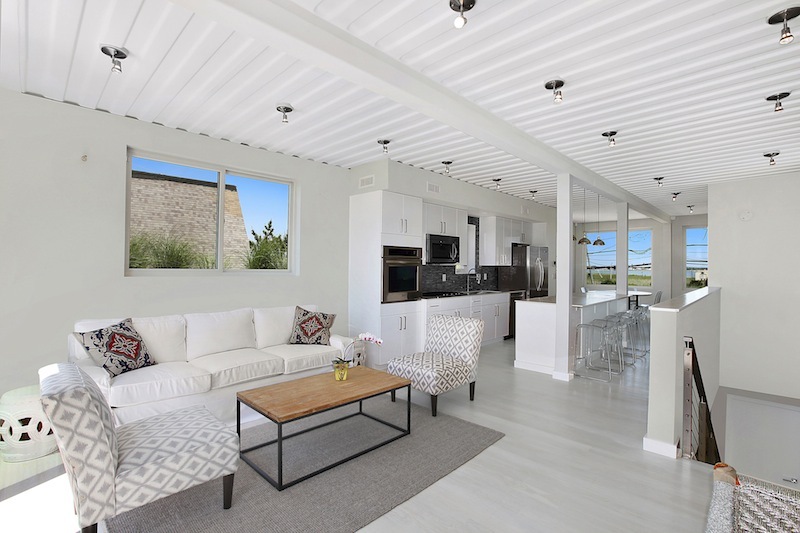 The open floor design allows for plenty of room when standing, and utilizing the beams harkens back to an almost large cabin-like experience. Again, we see an excellent use of bright color. The living area is tranquil and relaxing, while what looks like a sun room is bright and energetic. The wooden floors are a beautiful way to include the use of clean edges and lines, but the designers have still managed to sneak a few visual treats in there. 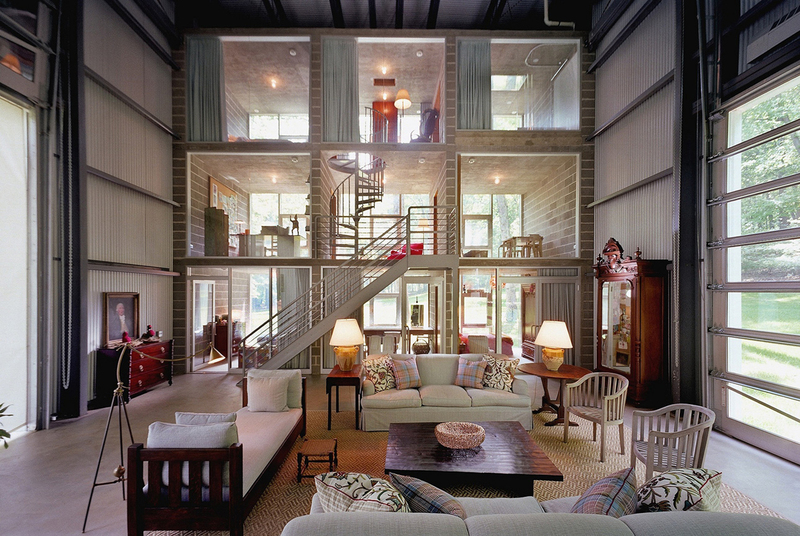 Like exposed container siding in the living area, for example.